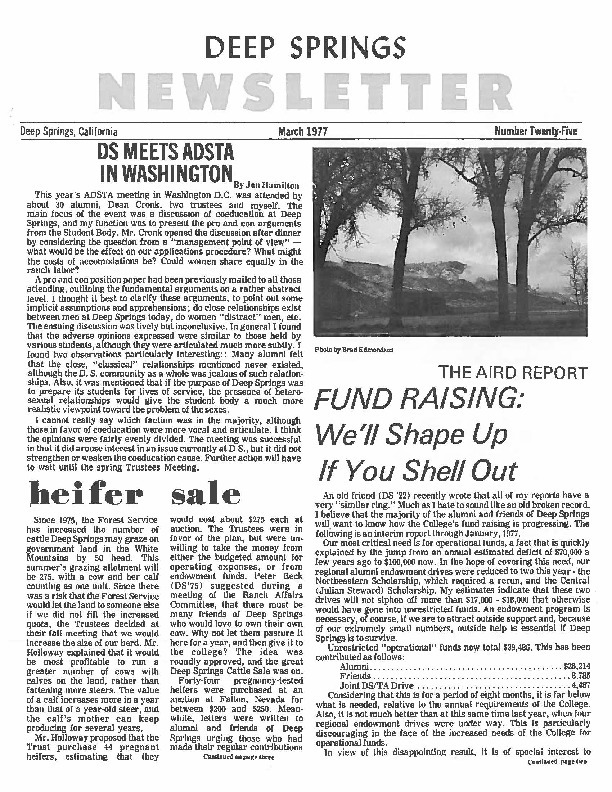 Articles include -- DS Meets ADSTA in Washington by Jon Hamilton - Heifer Sale by Loren Ihle - The Aird Report - Fund Raising - We'll Shape Up if You'll Shell Out by Bob Aird - There is no real wealth but in the labor of man - Shelley [Labor Report] by Bill Ragen - Academic Report by Tom Hutchins - Tribute to Dr. Julian Steward DS18 - A fe informal recollections and The Julian Steward Memorial Lecture by Bob Aird and Peter Beck - Its Name is Bufo Exsul by Dr. John Mawby - Most Fascinating News Story of the Week [re publication by Ray Huey] by anon. - To All Alumni and Friends [re Reinhart-Telluride Chair] by Erik M. Pell, President, ADSTA - A True Story - Notes from Underground [Well digging] by Brad Edmondson - First Returns on Coeducation Questionnaire by Garth Pritchard - Solar Energy Comes to the Valley by Peter Lehman - East Gobbles West in Turkey Bowl by Mario Loomis - Miscellanea by anon. Deep Springs College, “DS Alumni Newsletter March 1977,” Deep Springs Archive, accessed April 22, 2019, http://archive.deepsprings.edu/items/show/1299.